The Dunn’s River Falls and Park is Jamaica’s most famous water attraction, and it is one of the island's national treasures. Globally, it is as well-known as reggae and equally as stimulating. To the eager visitor, this attraction promises a truly authentic Jamaican experience filled with exhilarating climbs, refreshing pools with 'massage parlors' and some of the most beautiful scenery to be found. 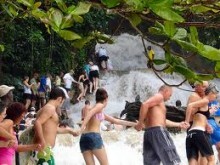 Climb the falls in a human chain led by experienced falls guides. If you are not that daring, view the activities from a safer vantage point on the terrace or deck. The falls climb to over 600 meters, and provide a refreshing flow of water, ending in a gentle cascade into the Caribbean Sea. Hold onto your hat, this is one wild ride! 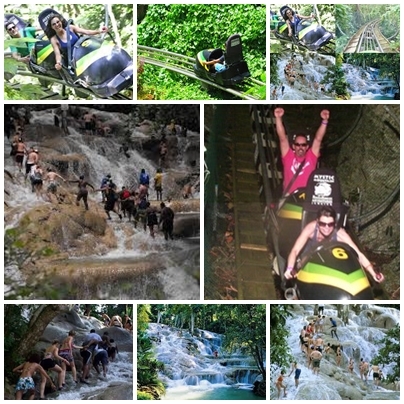 Inspired by the famous Jamaican bobsled Olympic team, the Mystic Mountain bobsled ride is the signature attraction of Rainforest Adventures Jamaica, ranked by TripAdvisor.com as one of the top attractions in Ocho Rios, Jamaica. You’ll be safely strapped into a custom-designed, high-tech sled and whooshed down a 1000-meter long track installed into the side of the Mountain, completely driven by gravity.